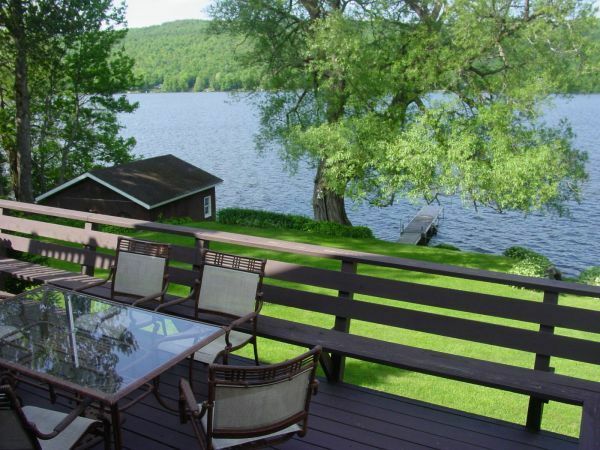 Located on the Sunny side of Chateaugay Lake (Not the Narrows) meticulously maintained three-bedroom Lakefront home. Enjoy the lake views from almost every room in the house. Home offers three decks overlooking the lake, a dock all on 100 feet of lakefront with a sandy swimming area on Lower Chateaugay Lake in the Adirondack Mountains. Home has Wifi, premium Satellite TV, DVD, AM-FM Stereo, phone, gas grill, washer/dryer and full kitchen. Walk into the lake from your own private beach and private dock., Boating, swimming, fishing from property. Don't miss out on one of the nicest rentals on the lake. This home is also available at a discounted rate for entire season or year round. Please call or email for details. Pots, pan, dishes, mixer, toaster, coffee machine, oven, microwave, refrigerator. blender, chopper, utensils, towels, pot holders, plate cups and many more. Boats, Canoes and kayaks availble to rent at Martins's Bait n Tackle, they will also deliver to house. Upon are arrival we were pleased to see the quality of the home, the property was clean and well equipped for our stay. The owners are fantastic people and take pride in what they have. If I could change anything it would be having tie offs on the dock for boats as well as column bumpers.Thank you for a memorable vacation. Thank you so much for the review of our property. Tie offs on the dock for boats as well as column bumpers will be added. Beautiful home and lovely to be on a lake. Lovely home! The living room is big and comfortable. The bedrooms are very nice. The willow tree is great to sit and read a book on vacation. We are happy you enjoyed your stay, thank you for your feedback. Beautiful sunsets and sunrises, canoeing over beautiful chateautigay lake.Catshing nice size small mouth bass. Just a few of the activities that made our stay most enjoyable and most of all very clean and nice living enviorment. What more would you want ? Plan to visit back again. Our family of five had an amazing time at this wonderful property. From touch football on the lake-front lawn to evenings on the deck and around the fire pit, this house has everything that someone would want in an Adirondack vacation. We rented a boat and zipped around wonderful Chateaugay Lake. The excellent Malone Golf Club is only 30 minutes away and we walked right on the course on a weekday. While we have traditionally spent more time in the High Peaks region, this is a really cool part of the Adirondacks with a ton to do. And if you are looking for hikes -- they are here too. Lyon Mountain is a several-hour climb. Great location with easy access to either Plattsburgh or Malone for shopping. The lake is great for swimming and water sports if desired. The owners are very accommodating and the house was spotless on arrival. I would and have recommended this camp to friends. The three decks provide great views of the lakes and we enjoyed the fire pit. It is so handy have a washer and dryer on premises. The new flat screen tv was a welcome addition.